Good morning! Wow, did you realize there are only ten days left until Halloween? And I still haven’t decided on costumes for my kiddos… I have some ideas. I guess it will depend on which costumes I can pull together in ten days! 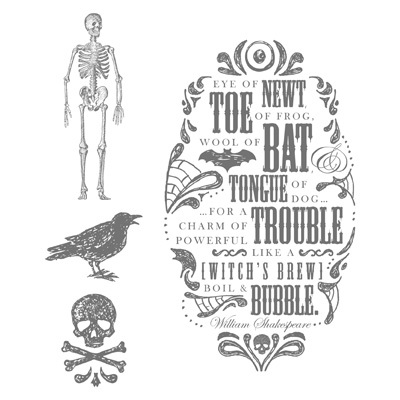 The Toil & Trouble stamp set was the first set in the Holiday Catalog that caught my eye. I pretty much got giddy when I saw this big stamp. So many things to do with it. 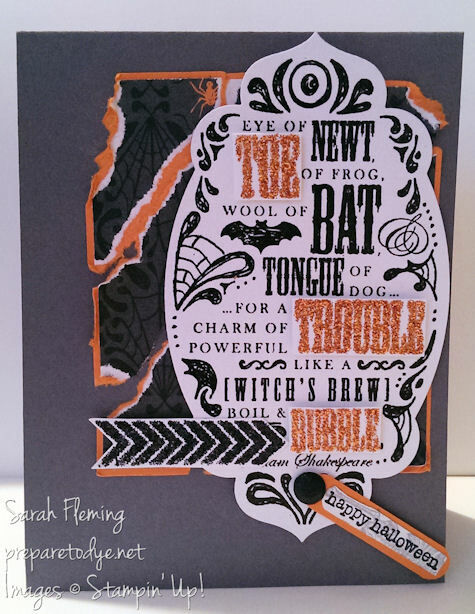 For this card, I played along with the Fab Friday sketch challenge — and what a great sketch! I’ll save this one to use again later. I matted the Witches’ Brew designer series paper on Pumpkin Pie cardstock, and then a werewolf came and shredded it. The big stamp is embossed with Black embossing powder on Whisper White cardstock. For the glittery pop-ups, I stamped the words again in Versamark ink, then added Heat and Stick Powder, melted it with the Heat Tool, poured on Orange Stampin’ Glitter, then heat set the glitter with the Heat Tool. The chevron arrow is from A Banner Christmas, and I used the same steps for it, except using Black Stampin’ Glitter. I’m not sure if you can see the detail behind “happy halloween”. I stamped the skeleton from Toil & Trouble in Basic Gray, then stamped “happy halloween” on top of the skeleton and cut out the sentiment by hand. It gives it just a little something extra. I hope you like the card. 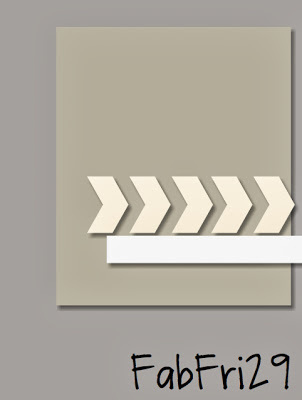 You can buy all of the supplies I used in my online Stampin’ Up! store, 24/7. Today is the last day to sign up as a Stampin’ Up! demonstrator for $25! Don’t miss out on this wonderful opportunity! You can email me for more information, or just go sign up at the link. Today is also the last day to sign up for my October Stamp-of-the-Month Club! This month’s set is Truly Grateful. Email me, or comment here or at the original post to sign up, and I’ll contact you. Great details on this card! I love how you tore and distressed the DSP behind the main panel and the glitter words are Fab! Thanks for sharing at Fab Friday! Very cute! I love the torn up background! Great idea and very unique! Thanks for playing at Fab Fri!